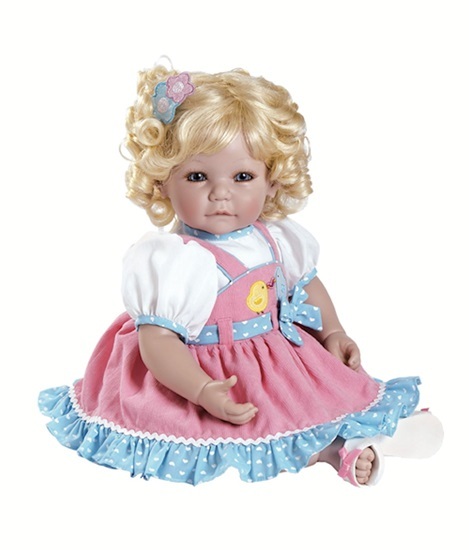 Chic-Chat is new in 2015 from Adora's Toddler-Time Collection of 20 inch play dolls. Chic-Chat is new from Adora in 2015. She's wearing a pink jumper trimmed with a blue ruffle at the hem that has a little white heart pattern. The sash at the waist and the piping around the blouse sleeves the the jumper bodice are the same pattern. Two chicks are applicaed on the bodice. Chic-Chat has blonde curly hair and big blue eyes. Chic-Chat is from Adora's 20 inch Toddler-Time Collection of premium play dolls. She has vinyl arms, legs, and head and a cloth body, just right for hugging. She has a baby powder scent.